The Discovery system was designed to address the trade-off departments have historically needed to make between ceiling- and floor-mounted systems, eliminating the need to compromise on patient access and image quality. This laser-guided, motorized mobile gantry allows complete access to the patient and unlimited parking capability, while creating sterility for a flexible operating room (OR) environment. 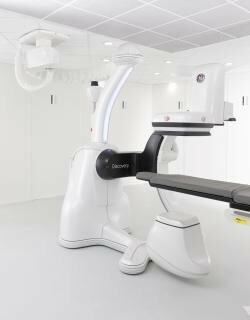 The unique gantry comes with a new wide bore design, which allows for steep angles, ease in 3-D acquisition, especially for large patients. Innova imaging system in the hybrid OR setting. With specifically designed table and accessories, the Innova IGS 520/530 OR enables both transcatheter and open surgical procedures in one room.